Urban Dream Brokerage Dunedin wrapped up the year with it's most fashionable project Citizen Stylist at 23 Princes St. I'm delighted to have helped broker nine diverse projects this year in Dunedin. These have covered many discipines and touched very different audiences: from a live digital mirror in Wall St Mall to an underground performance installation, and a retro games museum that boasted over 3,600 visitors in just 11 days! These projects could only have happened with the generous goodwill and spirit of our property owners in Dunedin's CBD, and we would like to extend a huge thank you to David Marsh, Justin Stott, Neville Hall, Tim Buchanan and Sarah Stevenson. UDB Dunedin also has a wonderfully active advisory panel who together have selected these interesting offerings to grace our streets. Thank you to: Cara Paterson, Josh Thomas, Chanel O'Brien, Peter Christos, Ali Bramwell, Vicki Lenihan, Caro McCaw, Annie Villers and Kirsty Glengarry for your huge effort, constructive opinions and precious time this year! An enormous thank you to the artists and designers who have given their tremendous talents and trust in UDB to create new experiences in the heart of our city for all to enjoy. From February - April 2017 we happily introduce Katrina Thomson who will be taking over as broker while I am away on Maternity leave. As a final sparkling Christmas gift from UDB Dunedin we would like to let you know that we are proud to announce we are the recipients of a grant from the Gigcity Community Fund for two new significant digital commissions for 2017. A call out for submissions will be made in late January 2017. UDB project Retro Games Museum in Dunedin. Image: Justin Spiers. Architect, property developer and current President of the Wellington Branch of the Property Council of New Zealand Mike Cole is a welcome member of the Urban Dream Brokerage’s Advisory Board, with a real passion for the city's future. Urban Dream Brokerage has also been working with property owners, councils and communities in Porirua and Masterton. "Our town and city centres rely on people being involved to grow their identity and character. As the economy recovers it can be even harder for new ideas to find space," says Mark Amery. As at the end of 2016, working with 35 property owners, the Urban Dream Brokerage has filled more than 55 vacant spaces with innovative creative projects in Wellington city, Porirua and Dunedin. The majority have led to new tenancies. “There have been 48 projects in Wellington alone, ranging from a ‘Moodbank’ – a place for Wellingtonians in a disused bank to register their moods – to a community-made giant iceberg, a koha café, an illuminated bike workshop and a “political hair salon”. In Dunedin recently over 3500 people in two weeks went to a Retro Games Museum in George Street, created from one man’s collection that usually fills two houses,” Mr Amery says. Urban Dream Brokerage brings together commercial property owners with projects. Architect, property developer and current President of the Wellington Branch of the Property Council of New Zealand Mike Cole is a member of the Urban Dream Brokerage’s Advisory Board. Recent 2016 Urban Dream Brokerage projects include the Lux Festival Light show Glade which attracted more than 5000 visitors to Clyde Quay Wharf, and in November a bold adaptation of a Shakespearean play set in the historic Grand Hall at the Public Trust Building, which has since been taken over by council as an Earthquake Response Centre. “These uses of vacant space also provides a tangible way for property owners to contribute to the community,” Mr Amery says. Bold new arts and community project for earthquake restrengthened grand historic Wellington space. It's four years since Letting Space's UDB service in Wellington launched this website and we've got a pretty picture to show for it. Our big thanks to the property owners who have joined with us in sharing a vision for a more diverse and liveable city. 34 properties and 48 projects in Wellington city, and counting. The dots on the edge of the frame denote properties brokered in Newtown and Johnsonville. "And most importantly we have created a place, and an inclusive community where people that were isolated and working alone can call home. Locally." Creating a home for enterprise and collaboration in the suburbs: Kathleen Wright on UDB project Sub Urban Co-Working in Johnsonville a year in. An opportunity to broker urban dreams for a few months in Dunedin in early 2017. Mark Amery chats to someone new at Letting Space: the remarkable Laurie Foon, new Urban Dream Brokerage broker, about the changing face of Wellington, and why she’s dedicated to it. This month we say goodbye to the wonderful Robbie Whyte as Broker for the UDB service in Wellington, and welcome Laurie Foon. In his farewell blog Robbie writes on legacy. What is a positive legacy? Is my legacy more positive than John’s? John Key was so very close to having a Kyle Lockwood designed flag as his timeless legacy. Would that have been a good thing? I think so, it would have made our country look a little naff, and in some way justified the $26million plus spend on the referendum. At least then we could have said that there was a majority - however big or small - in favour of the change. What we have now, is a positive/negative legacy. One that will be marked clearly in left leaning political history as a failure. One that will be ignored by the right. A $26 million referendum that flopped. Beautiful. I've just stepped away from Letting Space's Urban Dream Brokerage after what has been an incredibly valuable experience for me, both personally and professionally. Having the opportunity to work with the powerhouse team of Mark, Helen, Sophie and Tamsin has been an inspiring time. I have seen TEZA 2015 come through conception into reality, UDB Dunedin thrive as a successful remote pilot, numerous Wellington and Dunedin projects. And I've seen a lot of the interior of the community, social and public art landscape. What an insight it has been, meeting new people across Wellington, a lot of whom I will continue to build relationships with going forward. This is a big part of my decision to move on: this early part of my career is the time in which I should be taking risks, making mistakes and most importantly making art! So I am making the effort to take some of my own advice - from my last blog - and add value to my own personal practice and Wellington’s art/cultural landscape. Working on the Urban Dream Brokerage has, for many reasons, been personally and professionally valuable. What has been of the most value to me though, is knowing that I have contributed to the broader conceptual agenda of Letting Space and the Urban Dream Brokerage model. I amdeeply committed to positively developing the arts industry. Advantaging and championing artists where they might not be able to otherwise. Providing space and a platform to realise ideas that may change the way we perceive our culture, society and the arts. What an incredibly privileged position to have held, a beautiful thing to be a part of. My legacy might not be large or great, but it is a small contribution to something that IS truly great - the kaupapa that Letting Space works tirelessly to distribute - doing everything possible to increase access to space and build opportunities for artists and community groups to take risks, innovate and present their ideas to the public. However nuanced or radical these ideas might be, having the power to present ideas, for artists to be able to disseminate work is one of the most exciting things that I have been involved in to date. That is for certain. With all of my fingers, toes and any other possible body part crossed, by the time that you are reading this, there will be another wave of projects being presented through the Urban Dream Brokerage. Thanks to the generosity of property owners and the ambition of the artists/groups involved in these projects, we will have created - for a small moment in time - pockets of a more liveable city. Alternative spaces and projects working on the fringes of our neo-liberal society. A legacy that I have contributed towards. Maybe a more positive legacy than throwing away $26million dollars? Only time will tell. Sophie Jerram on pedalling like a hamster and an emerging citizen movement. The other day I got one of those Facebook messages reminding me what I was doing six years ago. It was a post from the final day - a chocolate fondue event in a vacant space - of Kim Paton’s Free Store. It was a project that gave Letting Space significant traction and, which through boldness, clarity of vision and popularity created a ripple effect on social art practice in New Zealand and in the community of Wellington. The now permanent Free Store next to St Peter’s in Willis Street is a descendant of this project, receiving commercial contacts and store fittings, and has an ethos of ‘no shame’. For the last six and a half years Letting Space has been addressing both social and physical emptiness: spaces made empty through a lack of ‘apparent’ economic activity. In 2009 Wellington felt more like a stalled fun park. We became experienced at persuading property owners (sometimes through personal connections, sometimes purer gall) to allow us to open the doors, keeping their fallow ground in the public realm through socially productive activity. We then created Urban Dream Brokerage to formally legitimate community and artistic uses for the wider conservative property sector. We were hedging the gap between the ‘market’ recommended rental price (prompted mostly by banks) and the creators of ideas who could readily fill the city The argument is that an occupied space is more valuable than an empty one. The cities of Wellington, then Dunedin and Porirua saw this work as something worth supporting on an ongoing basis after several years of trialing a funding model. Assuring legitimacy and care, and bridging the chasm between property owners and comprehension about what art can actually effect is core to the Brokerage service. We wanted to work in retail spaces to share the city with more people. We also had a drive to elevate social artistic practice into daily city life. “Imagine a city where artists were as visible as retailers,” we quipped. Enraged by central Government’s reversal of previous progressive environmental policies I sincerely believed then we were on the cusp of severe economic and environmental shocks. And that art played a role in raising awareness and perspective, offering a community of understanding. Though the world stepped closer to an abyss (we have just passed 400 ppm Co2, when in 2009 we were at 389) this country has not made many moves toward weaning from our systemic addiction to fossil fuels, for example. The reassurance of ‘business as usual’ has maintained the habits of the growth-focused enterprises that New Zealand has established during the last 200 years. The fun park wheel must be kept turning. The retail worm has turned since the 2008 financial slump: Wellington shops are fuller again. I was wrong in thinking crisis would be writ large. Did Letting Space through its Urban Dream Brokerage service just ‘fill the gap’ and lubricate the pathway for retailers to rapidly move in, we wonder? The art and gentrification process was well documented by Robbie Whyte in his May blog ('Does Gentrification Make Boring Art?') here. Even if the city keeps the fun park going we are in a different mode. A citizen movement has emerged in Wellington and across the world. Relationships have formed, both in frustration and in joy, that are tangible and non-tradeable. For the last six years we have helped keep Wellington accessible as a place for personal and political expression. Sometimes the gestures might seem small but keeping the city approachable as a place to try things out in has been a significant offer for over 150 communities and artist groups who have applied to the UDB service. Smoothing the way, we have given people the chance to become more adept at working with the public and with business, government and community. To partner up, and trial their work in public. We know we’ve added a greater range of voices to the city than was part of the polis before. Wellington would have been a poorer place had we not had projects that we shepherded into spaces such as The Market Testament, Imaginarium, The Beneficiary’s office, Moodbank, People’s Cinema, The Waiting Room, the Hawaiian Cultural Centre and of course, 17 Tory Street. 17 Tory Street deserves several columns in its own right - if you haven’t been and live in Wellington, keep an eye out for events. It has continued to thrive as an Open Source Community Gallery for over four years thanks to the vision and generosity of the property owner Michael Baker. It has also survived out of the sheer bloody-mindedness of a few, and the offerings of many volunteers: a home to great exhibitions, book launches, talks on capitalism, feminism, mindfulness and Palestine, as well as meetings for local businesses and as a food co-op drop off point. It can always do with more liaisons if you’re able to be flexible in your hours and want to help out - see www.concernedcitizens.co.nz. Later in the year I’m heading away to research from Copenhagen. Whilst there isn’t an exact equivalent to Letting Space in Denmark, there are many programmes that are sponsored by councils to ensure that community voices are heard in the future development of their cities. One destination is the former port town of Køge, which has an active multi-year programme called “Life Before the City.” Here turning a former port into a housing development is more than offering land to a corporation. Urban designers have been brought in to make community gardens, a dirt bike track, and unusual playground spaces, including a huge swing at the beach. Visitors are encouraged to play in this site in order that they might be able to imagine living there. Denmark is rich in the realisation that communities need to be allowed space and time to feel at home. Local councils are willing partners who enable communities to experiment and share their voices. The lack of an adversarial relationship between citizens and their local governments struck me as uniquely Scandinavian when I visited recently. It is illuminating to witness the sophisticated belief that ‘the people’ might actually know what is best for them - once they have been shown respect and provided with sufficient information. It makes me aware how much of my and my friends and colleagues’ lives has been spent wrestling with authorities for a voice in New Zealand. To many who encounter these urban interventions in Denmark, the experience of play and interaction may be very similar to that of experiencing social art practices, like those we have hosted through the Brokerage. In both cases there is surprise and curiosity about who has placed the piece in situ, or why. I want to keep aware of the distinctions between art and design. Urban design is mostly about problem solving. It softens the ground for new living and for controlling behaviour. Artistic processes on the other hand, tend to be characterised by a unique individual or group vision that may or may not solve anything. And from witnessing 25 years of art events I know that the commissioning of art can be just as willingly co-opted into social and political scoring matches - albeit in a rather less overt way. For the next year I want to research more explicit forms of community engagement than we experience regularly in New Zealand and learn about what it means to have a society driven by the needs of its citizens. Participatory design and community engagement led by Councils is not new in Denmark. It is these practices I’m yearning to learn about. From what I have heard the assumption of an intelligent citizenry sets the scene for a level of conversation that we might dream about with our political leaders in New Zealand. In the meantime, the Urban Dream Brokerage is still open for service in Wellington, Dunedin and another town or two (soon to be announced!). We keep on feeding the Brokerage flame because we believe it is a strong platform for independent citizen-led city making. As people with a love of artistic and community practice we’ve created a unique model, using our own connections into the city. I hope to share our citizen-led fervour with the Danes as I learn about the Danish way. Does Gentrification make boring art? After watching British critic Jonathan P. Watts’ recent film on Frieze about the relationship between artists and the co-option of vacant space, I have had a bunch of questions floating around my head. There Goes The Neighbourhood describes a number of ambitious arts projects and art spaces in London which have influenced, as well as been complicit in, gentrification. Art and artists often use, and directly benefit from the development of towns, cities and communities. The flipside of urban development is that artists - as well as almost every other community that bring diversity - are pushed out of affordable space to live, work and socialise. I have been wondering how this might relate to Wellington as the Urban Dream Brokerage, where I work as broker, is working within a facet of this ‘urban regeneration’ industry. I know that in the 90’s and early 2000’s the top end of Cuba St and other pockets provided a hot house for art and creative talent, with studios and flats affordable: germinating ambitious emerging artists, developing our art and culture landscape to what it is today. There are stories of Taika Waititi, Jemaine Clement, Jo Randerson and half of the Wellington art and music industry being active at the top end of Cuba St, Cable St and Newtown around that time. This prolific period was also assisted by the development of other successful initiatives like the Pace Scheme - affectionately dubbed the ‘Artist’s Dole’ - brought in by Labour, the growth of the Fringe and International Festival and spaces like Enjoy, BATS and Taki Rua-Depot, which allowed for the development of artist-run projects across the visual and performing arts. Numerous events, projects and galleries took on alternative project spaces. Like BATS, Enjoy is still running (about to turn 16!). It is hard to imagine it’s artist run origins as it plays a vital role as contemporary public gallery within the arts ecosystem. So where then, do we go to find the ambitious, experimental, alternative and flat-out risky projects that exist outside of the established institutions? Each year we see a bunch of student run exhibitions pop up around town. In traditional, alternative and vacant spaces, it is a refreshing few weeks in the art calendar. It reminds us that it is possible for experimental artist run spaces to exist. Just recently, I brokered the Urban Dream Brokerage’s forty-second project. Yet I still wonder where the rest of the participatory work is hiding. We have just been through an incredible festival season, with the Fringe, the Performance Arcade and the New Zealand Festival. All of which have been excellent contributions to the art landscape in their own way, but I wonder if this festival-centric culture is discouraging or distracting people from generating the really successful, genuine, grassroots projects. The kind of artworks, performances or ideas that are resourceful. Ideas so good, that you want to realise them no matter what. Maybe we need to be less careful with our ideas in terms of imagining them being big budget productions - we need to test, pilot and present these ideas. Take more risks with our work and practises. A lot of incredible proposals and projects are seeking funding to be realised. Would they happen if the funding isn’t obtained? If the art relies on the funding to exist, then funding makes very little art at all! It’s increasingly important that as artists we remain ambitious, but also, resourceful. I am not convinced it is more funding or artist run spaces we need. In Wellington Enjoy, City Gallery, 30 Upstairs, Toi Poneke and the dealer galleries all continue to do their thing. It is very specific and refined. What we are lacking in Wellington is experimental arts projects. Resourceful, flexible, site responsive projects. We have such a vast and varied art community in Wellington. I see Urban Dream Brokerage as a keen facilitator and advocate for anyone with an innovative idea for the use of vacant space. We have seen many exhibitions in vacant space - it is now a tried and true model. What we want to see is exciting interactive/participatory work that can really contribute to our cultural landscape, its feeling and energy. Urban Dream Brokerage is the sum total of its parts. It is a body of work that adds to a successful notion of utilising unused space in our city whilst simultaneously opening access to the arts, for public and practitioners. Making common ground. There are a couple of projects that for me, really exemplify an innovative concept and use of space. The ‘go to’ for me has been Moodbank. Vanessa Crowe and Sarah Baker’s project, initiated in a former bank in Manners Street and now gaining new incarnations, is an incredibly well developed and thoughtful conceptual artwork that is extremely accessible - because of its slick design and installation, not in spite of. It really shows how a significant artwork can present an alternative system and use in our rather linear thinking neo-liberal society. Another stand out, Amy Church and Hayley Jeffrey’s Imaginarium. An incredibly simple project that placed cardboard boxes, tape and some pens in what was Whitcoulls in Courtenay Place. All that was required was a little nostalgic creativity. And then there was Political Cuts by Barbarian Productions, a very well crafted participatory performance. Free haircuts and coffee in exchange for some thoughtful political discussion. In the bringing together of its different parts this was a significant artwork. We have plenty of incredible vacant spaces. So, I arrive at the point of challenging artists, students, community groups, designers - anyone with an innovative idea, to mobilise. As well as seeking funding. As well as putting your proposals into the established spaces, think about how you could expand your practice. How you might expand your ideas and engage a public or community in a meaningful way. Art is provocative right? We should share it. If we rely completely on established spaces we consign art to artefact - we allow it to become disengaged, boring. We need to avoid the gentrification of ideas by focusing on critical, relevant, experimental work. New ideas that push out far beyond the gallery. A space is available for innovative use on Clyde Quay Wharf! This month is the fourth anniversary of 17 Tory Street, the "open source community gallery" created by Concerned Citizens Collective back in 2012 out of the energy that the occupy movement in Wellington created. Its success is testament to the support, on the one hand, of property owner Michael Baker and post Christchurch earthquake regulations that have effected the buildings tenancy, and on the other the consensus decision making model (employing Loomio) that has allowed it to be voluntarily managed and pay host to 100s of events of every kind. Over that entire time collective The See Here has shown remarkable installations in a front window exhibition space. The mandate of 17 Tory Street has been to say "yes to as many as proposals as possible". It has embodied openness and generosity, providing (to crib the expression of Kava Club who have worked from here) "a safe place for unsafe ideas". It has continually inspired newcomers to find ways to replicate its values in their own communities. We have christened 17 Tory Street Urban Dream Brokerage Project #0 - this recognises that while it predates the setup of the UDB in late 2012 this was the first property Letting Space brokered beyond those it had done so for its own art projects. It also recognises that this was where Letting Space was based for two years, a space that encouraged our own openness to considering new models. The other Friday we had a pot luck dinner, and while I was setting up a woman came in to pick up her fruit and veges from the long running coop. She seemed to have little else to do with the space, yet expressed in her interest in our slide show an inspiration gained from being plugged in in a minor way to the space. That night at dinner I met two individuals currently involved in running Tory Street who I'd previously only encountered online - generous, full of energy and good ideas (kia ora Lucy and Grace) they were testament to how this space attracts change agents and allows them to grow. Unlike more rigid, hierarchical structures there's a flow here which makes succession arguably easier. Here's to the key individuals who keep that flowing. Happy birthday Tory Street. For more information on getting involved go here. A commission opportunity for artists in digital and physical space. The digital environment now connects us in ways that as children we could barely have dream't of. Geographies and landscapes collapse and offer new potentials for sharing and collectivising, while also bringing us together in physical space and connecting physical spaces. Letting Space through its Urban Dream Brokerage service is pleased to be able to offer creatives everywhere a commission of $2200 per project to create a data-rich project that has a physical node in a vacant Dunedin city space. The commission follows Dunedin winning the national ‘Gig City’ competition in 2015. As such all projects must involve digital installations that use technology to deliver their outcome.W e have just extended the deadline for two weeks until 5pm 8 September. Since 2010 Letting Space has placed over 70 projects in more than 30 vacant spaces over six New Zealand cities both as curators and as providers of the Urban Dream Brokerage. A UDB service was established in Dunedin in late 2015. Two examples of previous data rich Letting Space or Urban Dream Brokerage projects, accessible online and in physical space are Vanessa Crowe and Sarah Baker’s Moodbank, in Wellington and Auckland (Wynyard Moods) – see www.moodbank.co.nz - and Bronwyn Holloway Smith's Te Ika a Akoranga. Read the criteria here and (but of course) apply online here. You don’t have to be in Dunedin but the work must be based physically in a vacant space there. Its festival fever time, with the Fringe hitting both Wellington and Dunedin, and the Performance Arcade and New Zealand Festival off the mark in the capital. Diaries are filling, and so are vacant spaces with culture. 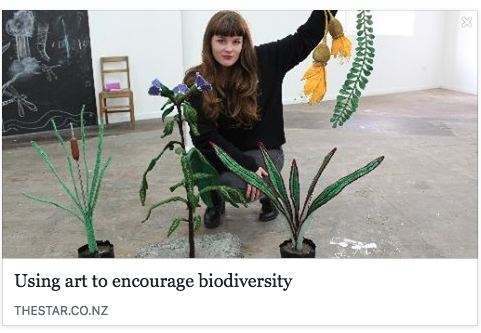 In Dunedin the UDB kicked off this year with the wonderful Wee Book and Upcycles projects, receiving lots of local press and support. Go here for images and links. Over summer in Wellington The Performance Arcade's Performance Lab have been enjoying the use of the high profile former Sandwiches Bar on the corner of Majoribanks and Kent as an office and space for participating artists to test out their new works. A rich and diverse program has been offered for the artists community ranging for work in progress showings, forums and presentations. Performance Arcade is on now on the Wellington waterfront and is looking really strong this year. Scratch Naut took over a Wellington City Council space on the swanky Clyde Quay Wharf for the public workshopping of new works last week - a flagship Fringe event. Those are just two of five UDB projects that have kicked off the year in Wellington with many more in train. You can view them all here. Our Porirua pilot finished at the end of January having placed 12 projects in four spaces over a six month period. Independent artist spaces The Living Room and Toi Wahine, had a great reception over summer and we're stoked to see the Toi Wahine collective now continue in Hartham Place under their own steam. They're currently taking submissions from young people aged 5 to 18 for an upcoming youth exhibition. Meanwhile round the corner in the windows of the Old McDonalds David Cook and Leala Falesuega's superb project with Russell and Discovery Schools incredibly continues to be exhibited in the windows of the Old McDonalds, 1 Cobham Court. Check it out when passing through. Our thanks to the generosity of property owners in Dunedin, Wellington and Porirua for helping make our cities sing. Hi, I’m Tamsin Cooper and I feel very honoured to have been appointed broker for the inaugural Urban Dream Brokerage Dunedin pilot. I grew up in the small rural town of Waikouaiti where I was fortunate to have had a wonderfully creative childhood. In fact it was my father and his work that first introduced me at just 8 years old to the idea that art can transform and engage the community. He helped set up The Creative Arts Trust who worked with mentally disabled people, recognising creative expression as a basic human right. I worked away from Dunedin for many years but have come back in the last few to live with my sons Hugo & Louis and we love it here! There is just so much going on for such a small city, it affords an amazing lifestyle and education, with access to a stunning natural environment and an ever inspiring creative community. I have had my own fashion label for the past 12 years and during the course of my business have worked on several creative collaborations on a national and international level. Highlights have been working with the Royal New Zealand Ballet on several projects and just last month helping manage the first ever NZ/Vietnam Fashion show and competition for design students in Ho Chi Minh City to mark our 40th Anniversary of bilateral relations. In the past I have worked as Community Arts Advisor and Business Development Advisor for Film & Fashion for Dunedin City, managed Planet Media at Otago University, marketed the International Science Festival and worked as the Youth Coordinator for Dunedin. I am a theatre graduate and have a personal passion for performance, public speaking and TV presenting. I firmly believe that public art can lift the soul of a city and those that reside within it. I love collaborations and working across disciplines to create the truly extraordinary. I welcome wholeheartedly all the knowledge, talent and experience that the Letting Space team and founders have and hope that I can learn much from them to help broker some fantastic projects for Dunedin. Submissions are now open for projects starting in 2016. We are looking for someone to help us with a pilot brokerage for Dunedin! READ ON for the job description. Want to help revitalise Dunedin City? Are you passionate about the role the arts can play in society? Feel you can talk to both artists and property owners as equals? This is a role to create new opportunities for the arts in Dunedin and help change the face of the city. Letting Space is a public art organisation looking to employ a self-motivated person to make a real contribution to the revitalisation of Dunedin city. Through the Urban Dream Brokerage service the Broker will process applications by artists and creative thinkers with dynamic projects for vacant properties. They will work with owners of suitable properties, liaise with owners and agents, and negotiate with both parties to secure properties under temporary licensing arrangements. They will promote Brokerage projects through strategically designed communications. The broker will be strong at making contacts with business people, artists and the media. They will be good at spreading the word about this innovative programme. This is a paid part-time contract available on flexible terms. The primary purpose of the role is to successfully coordinate the placement of fresh, unique and creative projects into vacant commercial spaces within the Dunedin city region. The secondary purpose will be to advocate and promote these projects, helping lead to the revitalisation of Dunedin city in the eyes of the arts, property and business worlds alike. 2. Developing a marketing strategy with assistance from Letting Space and promoting successfully brokered projects to a wide audience. 3. Promoting the brokerage to artists, meeting and discussing criteria with potential applicants. 4. Liaising with other key stakeholders such as the Property Council of New Zealand Dunedin branch, arts and business groups, Dunedin City Council Chamber of Commerce and key individual affiliates connected to the property industry. 5. Research, document and maintain a database of applicants and property owners. 6. Develop and write editorial relating to successful projects, and develop newsletters or other informative material. 8. Arrange property inspections to assess condition of sites and suitability for their use. 10. Develop initial relationships with further potential funders/partners of the Brokerage. 11. Maintaining excellent relationships with property owners and artists. The Broker will be expected to be able to work independently, but will be briefed and guided by the Brokerage's manager Sophie Jerram, in consultation with the Brokerage's advisory board and Letting Space producers Helen Kirlew Smith and Mark Amery, and the trustees of the Wellington Independent Arts Trust. This is a position for an Independent contractor for an Initial Period of three months (12 weeks) with the potential to extend for a nine month period (45 weeks approximately) until 1 July 2016. This is a part-time contract for service available on flexible terms but averaging 25 hours per week (pro rata $52 000 pa). The position is expected to start on 5th October and run until at least the end of June 2016. 1. Passion for the renewal and revitalisation of Dunedin city and a belief in the important role that artists play as agents of change. The Wellington Independent Arts Trust supports experienced Dunedin arts managers by providing an umbrella for significant independent arts projects. Mark Amery, Sophie Jerram and Helen Kirlew Smith are also managers of Letting Space (for more information see www.lettingspace.org.nz). This position is funded with the support of the Dunedin City Council. Trumpet time! On August 25 at Te Papa Letting Space was the Arts and Culture category winner and the Supreme Winner at the Wellington Airport Regional Community Awards for Wellington City. We'd like to thank all the artists we've worked with over the last six years, and the hundreds of volunteers who have helped realised Letting Space public art projects and the Urban Dream Brokerage - this award is for you all. Its wonderful to get recognition as a contemporary art programme alongside so many amazing community organisations as we work to explore how artists can be agents of social change and work to make cities living spaces.